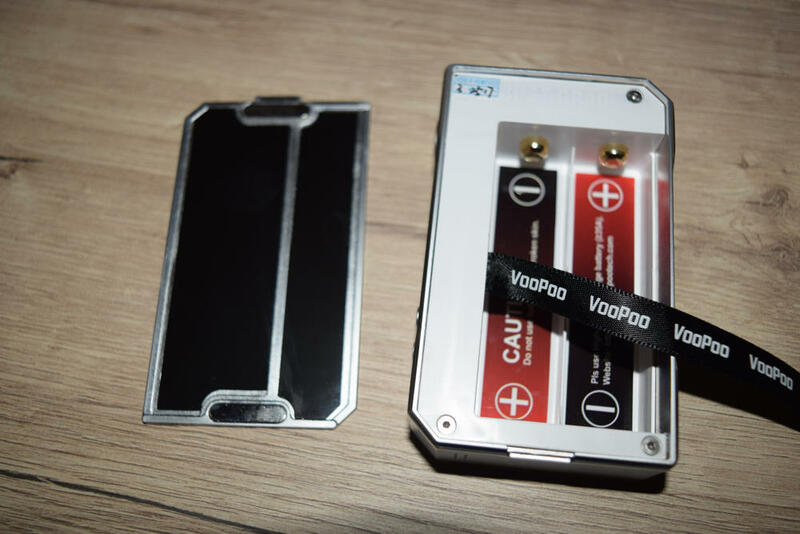 I never thought I would be saying this about a device called the “VooPoo Drag”, but it really is one of the most interesting, feature-rich mods I have ever used. 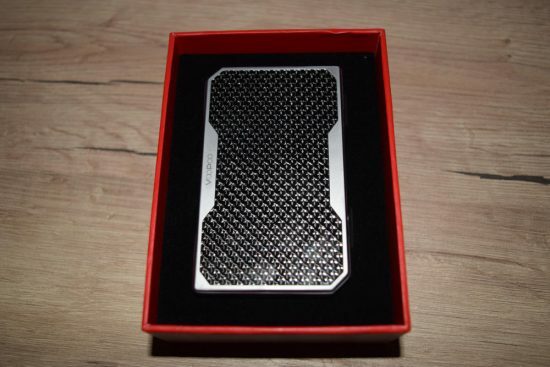 Everything from the build quality to the very efficient and responsive chip is outstanding, so if you can look past the unfortunate-sounding name and aren’t afraid to put your trust in a relatively unknown Chinese brand, you’re going to discover that this thing is well worth your money. The VooPoo Drag comes in the classic packaging used by most Chinese manufacturers, a rectangular cardboard box with the name and logo of the device on the front and, a short list of contents and company information on the back. Inside the box, we have the Drag mod sitting in a foam holder, and underneath that are a micro-USB charging cable, a user manual and a warranty card. That’s pretty much in line with most advanced mod kits these days. The Drag doesn’t come with a tank, so if you’re looking for an all-in-one sort of package, you may want to check out the Wismec Predator starter kit, or the SMOK Alien 220W. 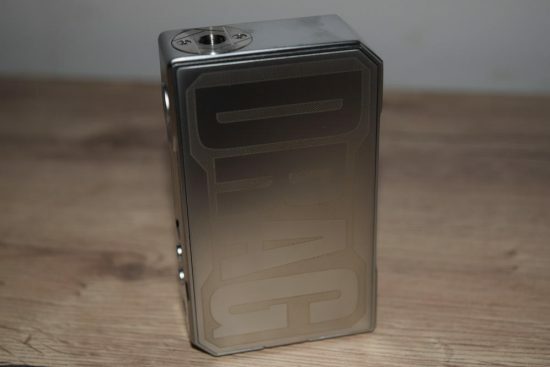 The Drag is a good ol’ fashioned box mod that doesn’t compromise on its rugged looks and feel by literally cutting corners for a more ergonomic feel. Measuring 90mm x 54mm x 24mm, this is just a mid-size device, but its classic rectangular shape with the straight edges and corners make it feel a lot more girthy in the hand than it actually is. So if want something that you can easily wrap your hand around when you’re vaping, the VooPoo Drag may not be the ideal choice, but if you appreciate the classic box mod design, and the weighty, metallic feel of a powerful mod, than you’ll almost certainly like this vaporizer. The VooPoo Drag has an anodized zinc alloy body which has been left unpainted for a raw metallic look. 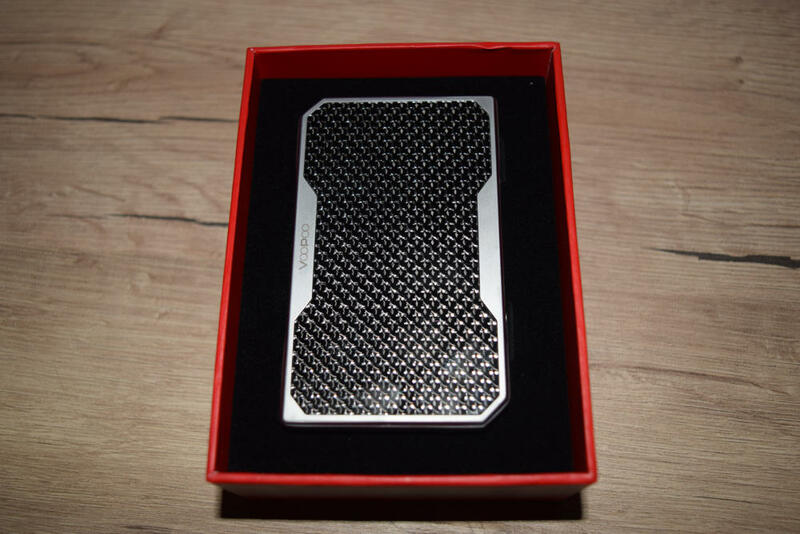 On one side of the device we do have a carbon fiber-like sticker which I didn’t think too much of at first, but having been using it for a week now, I’ve grown to like it. I have yet to see any scratches or signs of peeling on it, so even though it’s just a sticker, at least it looks to be of good quality. 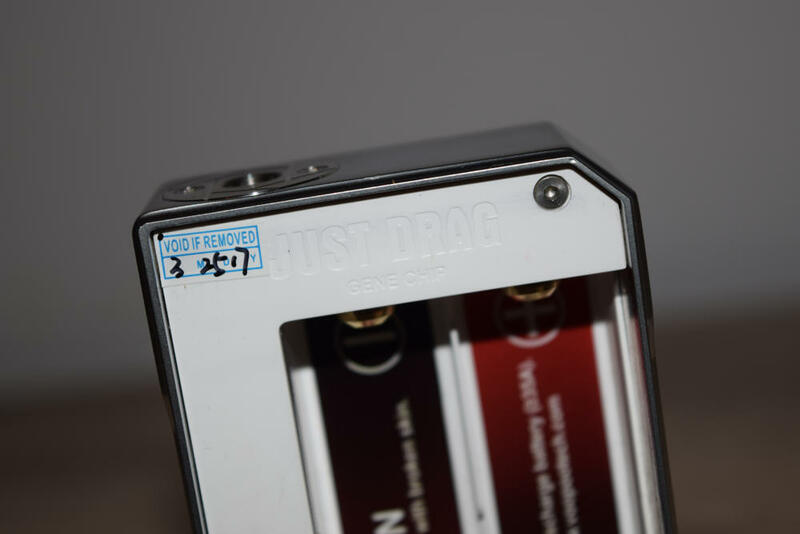 One the other side of the Drag, the one that also serves as a door for the dual-18650 battery compartment, we have the “DRAG” logo in giant font. 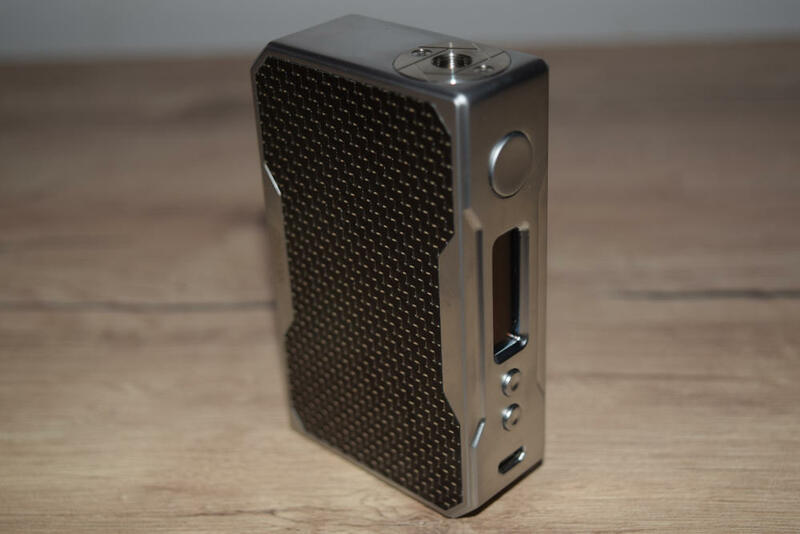 It’s not the most elegant way to brand a mod, but if fits in quite nicely with the straightforward design of the device. It looks cool, in my opinion, but I’m not sure about the quality of the etching, if I can even call it that. It doesn’t feel laser etched to the touch, so it might just be screen printed, but so far it hasn’t worn off at all. We’ll see how well it holds out in the long run, but I think having the logo engraved would have been much better. The battery door and compartment are both very well made. 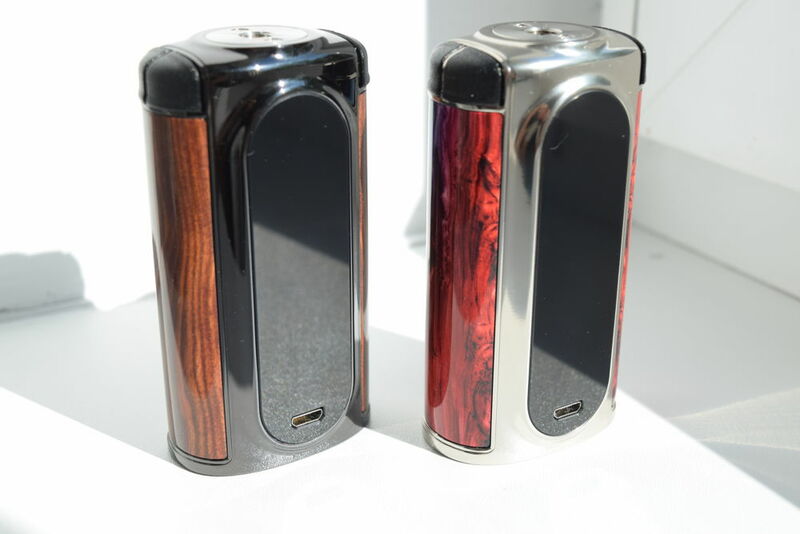 The door sticks to the mod with the help of two fairly large magnets that do a very good job of keeping it from wobbling while it’s in your hand, and has a layer of plastic insulating the inside to prevent the metal from coming in contact with the batteries. 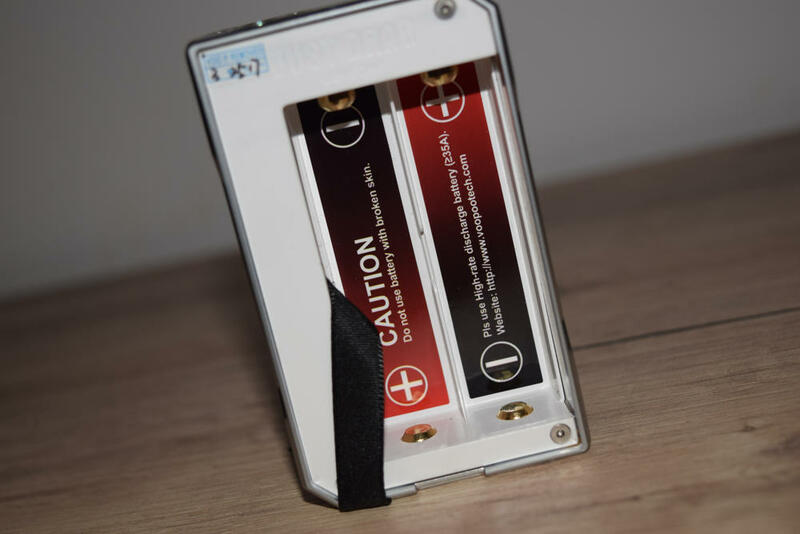 The two battery trays inside inside the mod are clearly marked to help users insert the batteries the right way, and the battery pins are spring loaded. And even if you somehow manage to ignore the markings and insert the batteries wrong, the Drag has reverse polarity protection, so you should be fine. The VooPoo Drag control panel has a classic layout, with the fire button sitting right above the central LCD display and two small adjustment buttons under it. Near the base, we have a micro-USB port that can be used for on-board battery charging and software updates. The metallic buttons are very well made, they have that satisfying click when you pressed them, they don’t rattle at all, and the large fire button has a bit of indentation which fits either your index finger or your thumb perfectly. 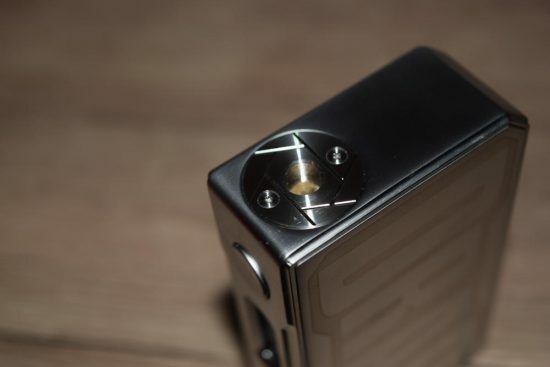 The 510 connection sits flush on top of the mod, but stands out because of the shinier finish. It is screwed on to the device with two small screws and has firm spring-loaded pin made of gold-plated brass. One nice thing I noticed is how deep the threading goes, and after testing various tanks and RDAs, I can confirm that everything sits perfectly flush on the VooPoo Drag. I was very impressed with the look and feel of the VooPoo Drag. I wasn’t expecting very much from a Chinese brand that I basically knew nothing about, but this thing is really well-made. The metallic body is thick enough to give it a weighty feel without making it too cumbersome to hold, the buttons and battery door are nice and firm and the 510 connection is one of the best I’ve seen. This is where the VooPoo Drag really shines. It’s a nice looking mod, but what really blew my mind was the number of interesting features and customization options available. But before we get into details about that, a few words on the display and menu. The Drag has an average size rectangular display. It’s very bright by default, but you can adjust the brightness via the software interface that can be downloaded from the VooPoo website and installed on a Windows PC. 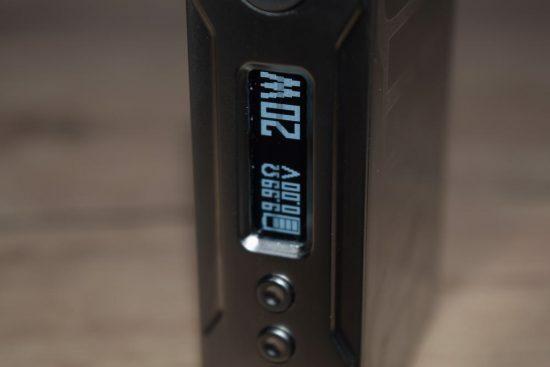 You can also set how long the screen stays on after each button activation, and set a custom logo to replace the default “VooPoo” message you get when you power on the mod. Menu navigation can be a bit overwhelming at first, but that is to be expected from such a complex device. 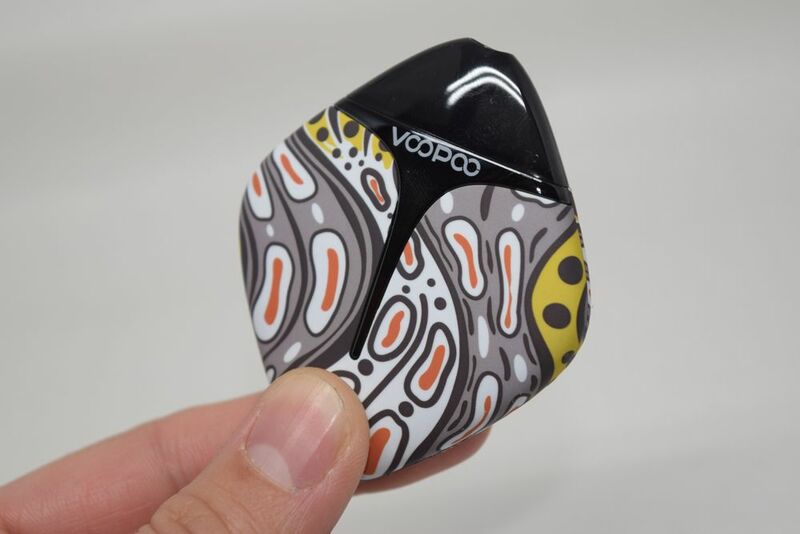 One thing to remember is that you can only access most of the features via the mod interface, with the rest being customizable via a companion app that you can download from the VooPoo Tech website. So the way I see it, you have two menus, one that can be browsed through directly on the home screen, and a separate one that you enter by keeping both the “up” and “down” adjustment buttons pressed for a couple of seconds. 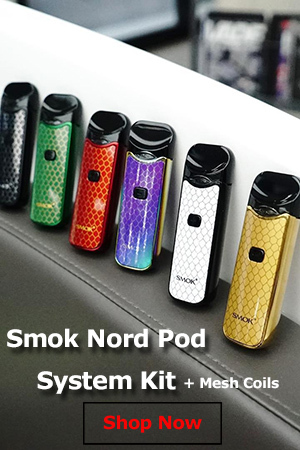 To browse through the available vaping modes – wattage and temp control (with its supported materials), you have to press the fire button three times in rapid succession. You can also lock the buttons of the device by keeping the “up” button and the fire button pressed, and flip the orientation of the display, by pressing the “down” and the fire button. Depending on whether you are in power mode or in temperature control, the second menu will have different sub-menu icons. We’ll start with the power mode menu, because it’s easier to figure out. First there’s the “W” icon which simply takes you out of the menu, then there is “M 1-5”, where you can choose from five different memory modes, the “SN” where you can check the serial number of the mod, and finally there is the floppy disc icon which shows you the firmware version you have installed. In temp. 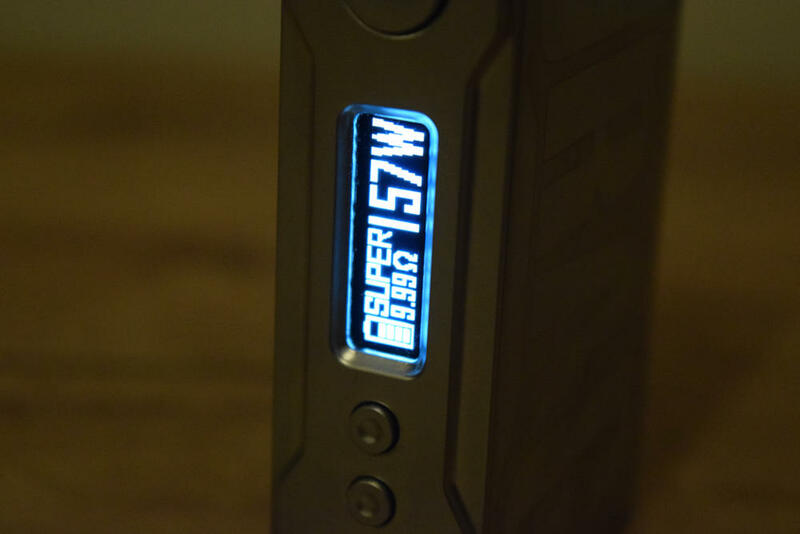 control mode, the menu will have all the icons of the power menu plus an “Ω” icon, where you can change the resistance of the atomizer – which I don’t recommend you do – and a “Fahrenheit” symbol which is actually the TCR option. This allows you to set the temperature coefficient for the type of material you’re using. This is also an advanced feature that I don’t recommend you play with unless you know exactly what you’re doing. If you select memory mode from the menu, you will be able to create custom power curves for each of the five memory modes. You start by pressing the fire button four times, which will open a small graph on the display. You can then use the adjustment button to set the temperature/wattage for the first 10 seconds of your draw. There are 10 blocks that you can set on screen, each of which represents one second of the draw. So you can set the mod to fire at 80W for one second, then have it go down to 70W or up to 90W the next second, and so on. This is basically a tool that lets you customize your vaping experience, or just experiment. Either way, it’s nice to have. This is pretty much all there is to the VooPoo Drag menu system, but you can do a lot more via the VooPoo app, which first has to be installed on a Windows PC. You definitely don’t need it to use the mod, but if you want the whole Drag experience, I recommend you download it and check it out. Installing the app is a piece of cake, you basically follow the steps of any Windows software installation and just click finish. Once you’re done, just open the app and connect the VooPoo Drag to your computer via the micro-USB cable. That’s about all you need to do, but just in case you run into problems, the app comes with a detailed user manual as well, which can be accessed in the “Help” section. The most important function of the app is obviously the firmware upgrade for the VooPoo Drag. Mine came with the 1.0.0.0 version, and I was able to upgrade it to v. 1.0.0.1. It’s a simple and quick process, so I recommend you do that as well. The app also lets you do a lot of customization on the mod. For example, you can change the brightness of the display, change the startup logo from “VooPoo” to whatever you like, be it image or text, as well as customize all the different error and warning messages you receive. For example, you can change the high temperature warning from “Temp High” to “Hot as Heck”, or a flame image. Sure, these things don’t affect the vaping experience, but they let you make the device truly your own, which is super cool. The app also allows you to set the battery cutoff time, as well as create those memory mode power and temperature curves on your monitor. It’s basically the same as doing it on the device, only the graphs here are much larger, and you don’t have to click the little buttons a million times. That’s about all I figured out about the app, but there could be more to it than that, and VooPoo could add more options in the future. It’s already the most complex mod companion app I’ve ever used. I honestly wasn’t expecting so much from this mod, but it really proved to be a very impressive piece of technology, probably more advanced than any mod I have ever used before. And we haven’t even talked about how it vapes, yet. After tinkering with all the features and options of the VooPoo Drag, I was curious to see how it vaped. After all, customization options are nice and all, but if a mod doesn’t perform very well, it’s pretty much useless. Luckily, that’s not the case with this device. I hadn’t heard of the new Gene chip before, but after seeing what it can do, I’ll definitely be keeping an eye on it in the future. 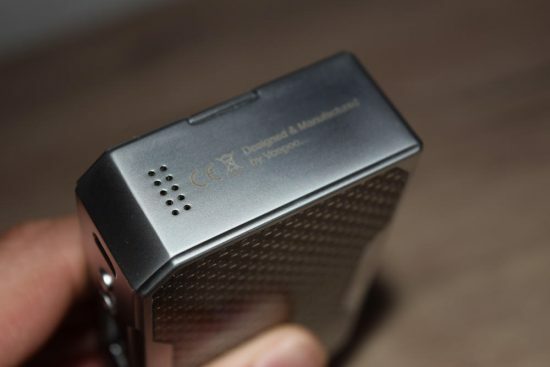 It’s a really smart chip, developed by an American company called Woody Vapes, and I have a feeling we’ll be seeing it used in a lot of vaping devices going forward. The first thing I want to talk about, and, in my opinion, the most amazing thing about the VooPoo Drag, is how incredibly fast it fires. There is literally no delay, you just press the fire button and you can hear that juice sizzling inside the atomizer. It’s faster than any other mod I have ever used, and there have been a few. I just can’t praise this responsiveness enough, and all I can say is that I wish all mods were as quick as this. Normally, all regulated mods have a firing delay, sometimes it’s shorter and sometimes it’s exasperatingly long, but it’s always there. Not the Drag though, in that respect it’s more like a mech mod than a regulated one. Next up is the smart resistance reading technology. Every time you screw on an atomizer, you’ll see a question show up on screen: “New Coil, yes or no”. If it’s the same coil you had on before, it will keep your previous wattage or temperature settings, but if it’s a new one, it will read its resistance and change the power output accordingly. It’s always going to set the wattage conservatively, because its main purpose is to make sure that you don’t accidentally burn your wicking, by applying too much power to a high resistance atomizer. For example, for an 0.26Ω Kanthal coil, it automatically set the wattage to 45W. That’s a bit low for my liking, but I don’t mind bumping up the wattage manually and knowing that I’m never in any danger of accidentally burning a coil-head. Then there is the SUPER Mode. The VooPoo Drag has a maximum power output of 157 watts, but while you can scroll all the way up to that with any coil you have on, you won’t actually be able to fire unless the mod detects the resistance as low enough. If that is the case, once you reach 129W while adjusting the wattage, the browsing will stop, and you have to press the “up” button again to resume. 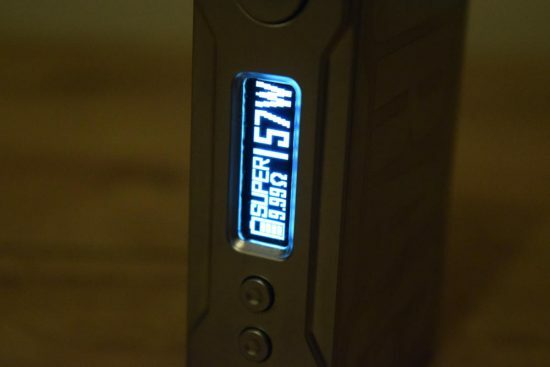 At that point, the voltage icon on the display will change to “SUPER” letting you know that you’re, well, in super mode and you’ll be able to activate the mod at high wattage. 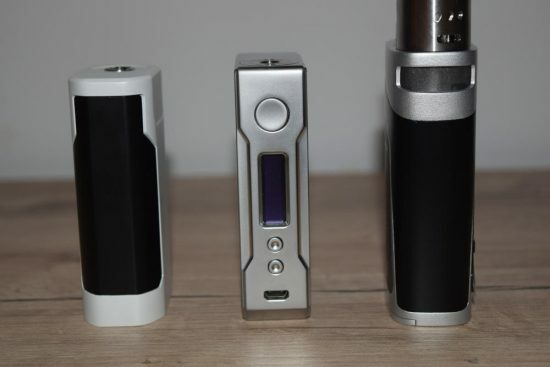 I haven’t tested the temperature control mode too much, but I can tell you that the Drag supports the usual materials – stainless steel, Ni200 and titanium – and that it packs a bit of a punch compared to most other devices I’ve used, without burning the wicking. Finally, I can report that the Drag supports on-board battery charging, as it features balanced charging technology. 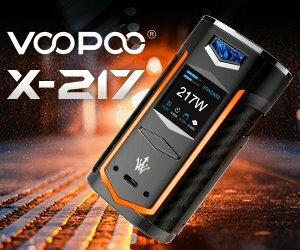 The charging rate is reportedly around 1.8A, which is almost as fast as the the 2A charging speed of the Wismec Predator 228. 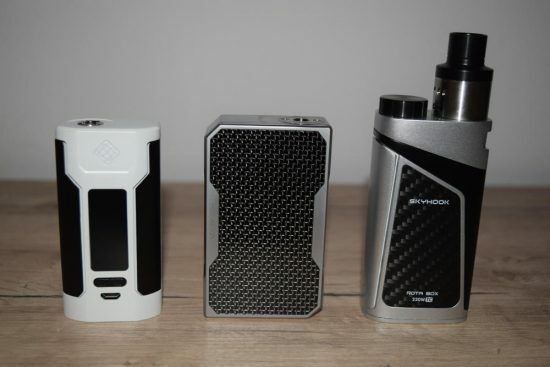 As I mentioned several times throughout this review, the VooPoo Drag exceeded all my expectations. Granted, they were pretty low, considering that to me it was just a no-name device, but certainly didn’t expect it to be this impressive. Everything, from the quality of the materials and how well the mod is put together, to the various features, the complex computer app and the responsiveness of the fire button, is just amazing. I never imagined I’d be saying this about this mod, and no I didn’t get paid to do it (sick), it’s just that good. Heaven Gifts currently has the VooPoo Drag on sale for $69.99, which I have to say is a decent price for such a great quality device. 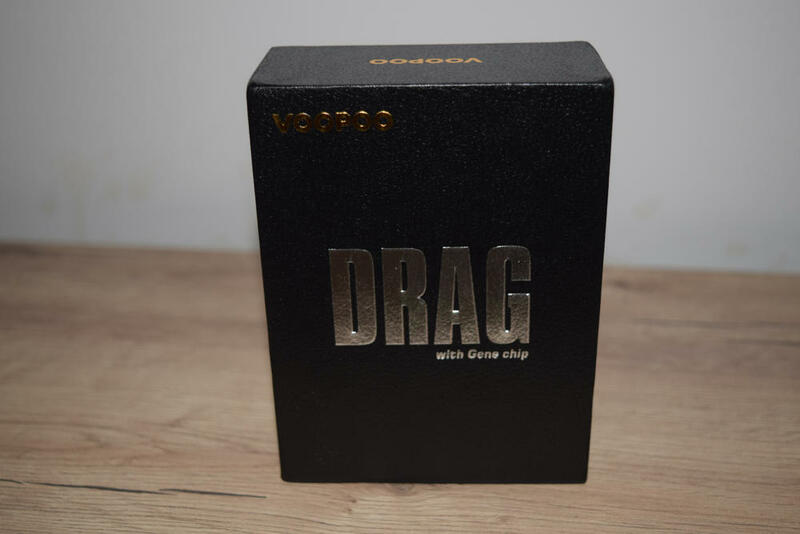 If you’re willing to take a chance on an up and coming brand with a funny name, the Drag will certainly not let you down. I was already considering this mod. I have a Smok Alien (Star Wars Imperial Edition) and a Sigelei Kaos, but the screen on the Sig just crapped out on me one day. Not to say that I haven’t dropped the mod before, but when it finally cracked, it wasn’t because of an impact of any force. When I put it into my pocket, it worked. When I pulled it out, it didn’t. 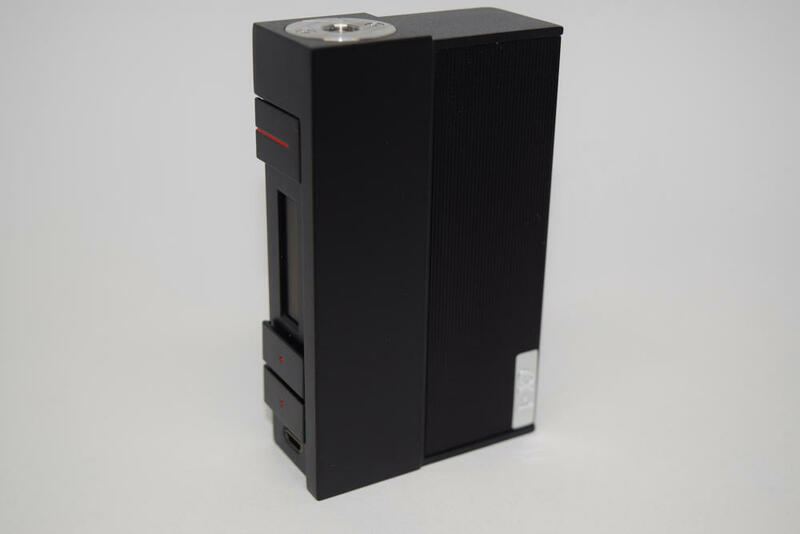 Since then, I’ve been on the lookout for a new box mod that has good power, a nice look, and packs as much band-for-my-buck as I could find. The Voopoo Drag was at the top of my list, and this review just confirms what I was already thinking. Thanks for the great detail and some information that I hadn’t read anywhere else. I’ll be ordering mine from Vaporider right now ($45.95). This is a good and useful review. Just swore off Sigelei following two failures, the last on a Kaos, relating to separation of tops from mods. Local vape shop suggested I look at the Voopoo Drag. 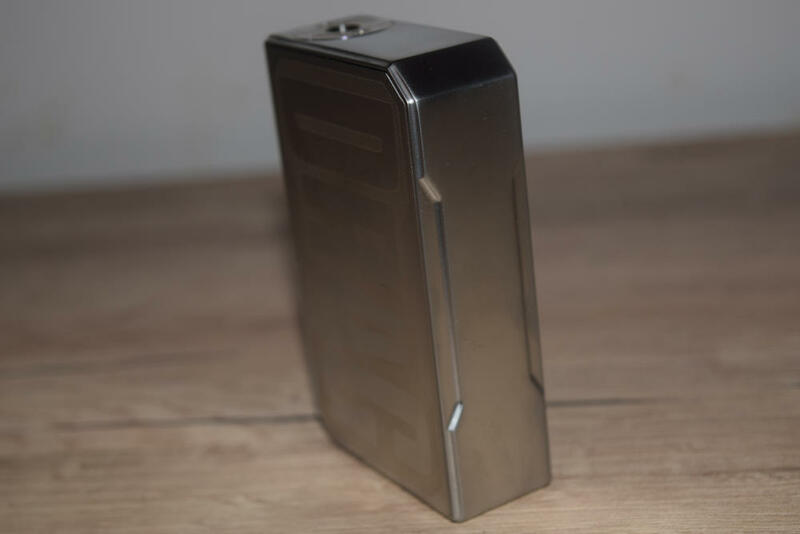 This mod is designed well, has a somewhat retro feel, and it’s durable and well-made, with very secure magnetized battery cover, and no button rattle whatsoever. Windows (only) software is decent. The Gene chip seems impressive, but the manual is a challenge, so you might not initially be aware of all that it can do. All in all, the Voopoo Drag brings strong features, design, and premium machining at a very good price point. Bit late I know but maybe a reset to default could be the answer Matthew. My problem is extending the time it stays on after last button push. Presently mine switches off after 10 secs or so which means another 5 button dab each time I wish to vape. Negates the fast start up time somewhat. Thats a feature of the latest firmware, and there is no option to disable it, if its bothering you as much as it was me drop back to the firmware before. Steve I bought a ewell crown brand new with the upper tank loose from the factory(note it has a reverse thread) once I figured that out I was a happy camper, was able to adjust my mod AND IT WORKS AWESOME.